The US Census Bureau just released its population estimates for 2017. They are a giant red flag for Houston. Most stunning was that the Census Bureau estimated that the City proper only added 8,200 new residents in 2017. The growth rate for the year was four-tenths of a percent (.4%). 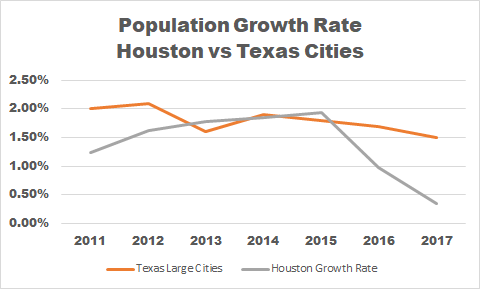 The report showed a slowdown in growth for the entire region, but Houston’s decline was much more dramatic than its suburbs. By the way, these estimates were as of July, so they do not include any effect from Hurricane Harvey. So, next year’s numbers are likely to be even worse. 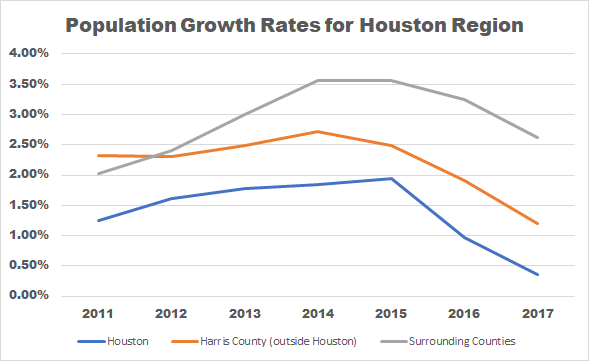 The portion of Harris County outside of Houston grew by about 28,000 new residents, a 1.2% growth rate. But the seven counties surrounding Harris County grew by nearly 53,000 residents, which was a 2.6% increase. Houston’s growth has lagged the suburbs for some time, but the trend is accelerating. The same is true when Houston is compared to the next five largest cities in Texas. To put the numbers is a somewhat larger perspective, the US and Texas populations grew last year by .72% and 1.43%, respectively. In other words, Houston grew at only half the rest of the country and only a third of the rest of Texas. The drop in the Census Bureau’s estimate is so dramatic in for last year that you have to wonder about the accuracy of the estimate. The City has already indicated it intends to challenge the estimate and it has had some success in doing so in the past. But even if last year’s estimate is off, the broader trend is clear and is supported by other data. For example, HISD enrollment has been nearly flat for the last decade. [i] After discounting for inflation, Houston sales tax receipts have barely grown for the last five years. Growth is slowing in generally both nationally and in Texas. But while our region, outside Houston, is holding its own compared to the rest of the state, Houston itself is not. More importantly, that gap is growing. [i] HISD enrollment increased in 2014 from the absorption of North Forest ISD. Discounting for that increase, HISD growth in enrollment has been about .5% annually.